To discover her voice. Her intellect. And her ability to understand others. Her courage and tenacity are always on display in the classroom, on the playing field, and out in the community. To learn. To create. To discover and master unfamiliar terrain. She wants to tackle complex real-world problems, find solutions, and grow into a courageous leader who will shape her generation. To explore, to reach higher, to experience the joy of discovering their very best selves. So by the time our students graduate, they're ready to succeed in whatever paths they choose. To take the lead. Be class president or a math whiz. A record-breaking athlete. The soloist. Or anything else she can imagine. Here, we don't put girls in a box. We take them outside to get their hands dirty. Watch them tinker in our iWonder Lab maker space and Innovation Center to ignite their curiosity and creativity. Because here, she will be empowered by all that's possible. Because we know girls, and our girls are known. From PreKindergarten through senior year, Agnes Irwin nurtures the journey of self-discovery and empowers girls to recognize that they can do anything they set their minds to. Preparing girls to lead and succeed is in our DNA. 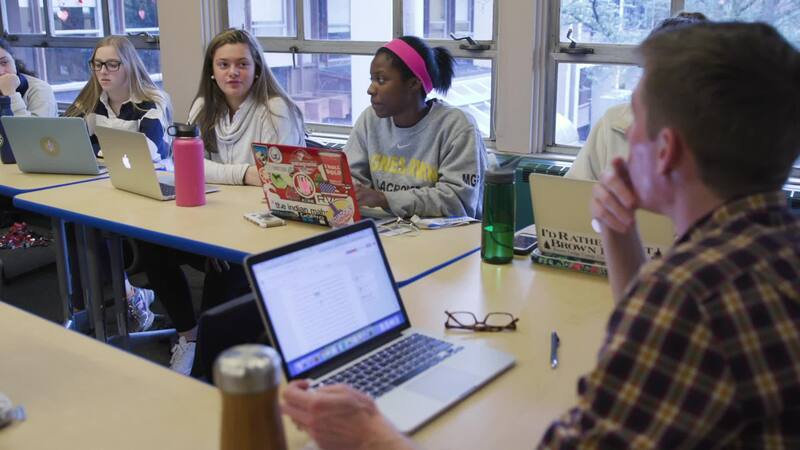 Only here will you find The Center for the Advancement of Girls: it's the force that infuses relevant girl-centered research into the Agnes Irwin experience, impacts our rigorous curriculum, and creates programs and partnerships to enable girls to hone their leadership skills and develop their voice. Think of it as our superpower. Everything we do is centered around what is best for girls. Only at Agnes Irwin, the Center for the Advancement of Girls is dedicated to creating the most advantageous environment for girls to thrive — starting in PreKindergarten through graduation day — and beyond. We embrace research-driven and student-centered pedagogies and bring them into our classrooms — creating a relevant, immersive, and engaging learning experience designed just for girls. We partner with colleges, universities, and nonprofits to expand our curricula and extend our educational experiences — allowing our students to apply what they have learned in the classroom in powerful and innovative ways. We participate in academic research with leading colleges and universities that advocate and study the trends, influences, and experiences that shape our girls' futures. AIS taught me how to be bold and unapologetic in my pursuits. I sincerely doubt that I would even be an entrepreneur today without the confidence and sense of open-ended possibility that I got out of my Agnes Irwin education. The best part of my job is watching a student have an "aha" moment. I have found that the biggest breakthrough moments come when students are faced with something that really scares them – from belaying off a cliff to failing a test — and realize that they can become stronger as they move through those scary moments. I like Agnes Irwin because the founder of the school was independent-minded — just like me. In my computer science classes, a number of students have discovered that coding is a passion they hadn't considered before. These students have gone on to major in CS in college. It makes me happy to know that I was able to nurture this new dream. Read on to learn about accolades, accomplishments, projects, and events at Agnes Irwin.